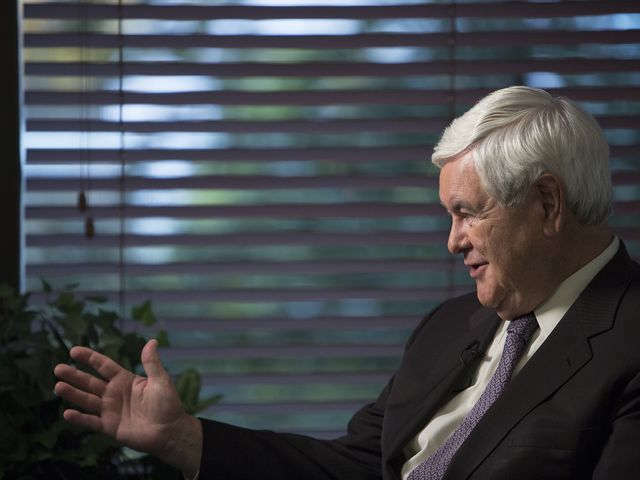 WASHINGTON — Former House speaker Newt Gingrich calls Donald Trump a potentially transformative president. But he shouldn't have sent out that tweet alleging election fraud. In an interview Tuesday with Capital Download, Gingrich, a free-wheeling Trump adviser who is a vice-chairman of his transition team, described the president-elect as a leader who is poised to disrupt the regular order in a way no commander in chief has done since Andrew Jackson in the 19th century. But he also said that Trump's biggest misstep in the three weeks since he won the White House was to post on Twitter Sunday a complaint asserting widespread voter fraud, and in an election he won. "In addition to winning the Electoral College in a landslide," Trump wrote, "I won the popular vote if you deduct the millions of people who voted illegally." "The president of the United States can't randomly tweet without having somebody check it out," Gingrich told USA TODAY's weekly video newsmaker series. "It makes you wonder about whatever else he's doing. It undermines much more than a single tweet." Does he see any evidence of millions of illegal votes? The former House speaker, who led a political disruption of his own when Republicans won control of the House of Representatives in 1994, says the best thing Trump has done so far is to name campaign chairman Steve Bannon and Republican national chairman Reince Priebus to his top White House staff. "You have a very hard-line conservative warrior as your chief strategist and you have a really sophisticated manager of the establishment as your chief of staff," he says. That said, Gingrich is caustic toward another potential Trump appointment, of Mitt Romney, the GOP's 2012 presidential nominee. Trump and Romney were slated to meet Tuesday for a second time, reportedly to discuss the role of secretary of State for the GOP's 2012 nominee, who was perhaps Trump's fiercest Republican critic during the campaign. "I think it's outrageous," Gingrich says. "Romney said vile and vicious things. Romney opposed him all the way up to the election. In my judgment, Romney will be a very high risk ... because I think Romney has zero interest in the Trump revolution and every interest in re-establishing his own credentials." While he views former New York City mayor Rudy Giuliani as a better choice, Gingrich says House Speaker Paul Ryan "is very strongly in favor of Romney" and that Priebus is "pretty strongly" in favor of him. Trump campaign manager Kellyanne Conway, however, has warned of a grassroots revolt if Romney is named to the Cabinet's top job. He argues that Trump, who hasn't held a news conference since July, should feel no obligation to hold any as president, suggesting instead he solicit questions from the public to answer. "The news media so totally disgraced itself in this election, if I were Trump I would just say no," Gingrich says. "And if the White House Correspondents Association doesn't like it, I'd say, 'Fine, disband.'" Gingrich says the political world hasn't yet come to grips with the sort of fundamental change the election of "the most insurgent president in American history" could bring. He describes Trump as "one-third Andrew Jackson in disruption, one-third Theodore Roosevelt in sheer energy, and one-third P.T. Barnum in selling all the time." But he says Trump might need to occasionally curb his instincts. "He should tweet, but he ought to have an editorial board in-between the first draft and sending it," he suggests — not an idea Trump seems likely to accept. "But he shouldn't give it up, and he shouldn't give up being Donald Trump. He got elected being this unique, charismatic, entrepreneurial guy who breaks lots of rules. ... If he starts getting to be normal, he'll cease being Donald J. Trump."